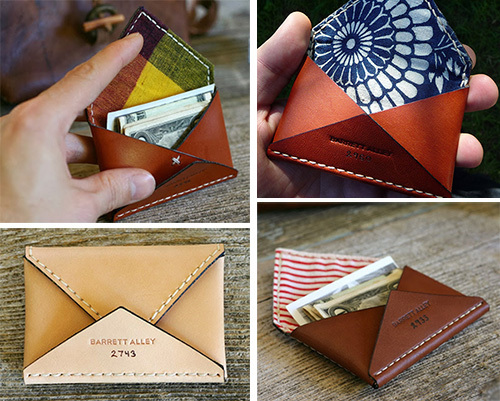 His latest creation, the Reuben Wallet is 2.5" x 3.5" and meant to hold up to 8 credit cards or a mix of cards and cash. It's not a carry all by any means- just there for you when you want to keep it simple (and stylish). 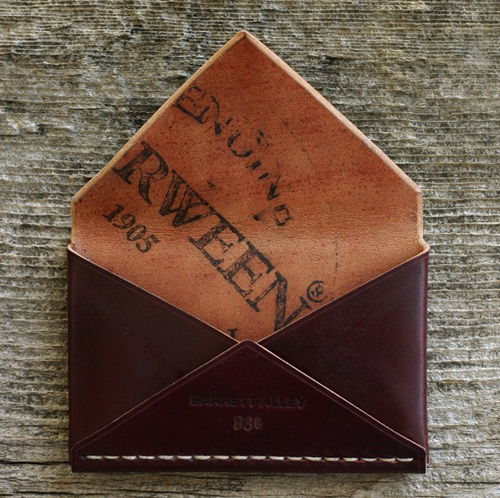 I like to think the Reuben Wallet is a manly necessity, functional yet modern and classic. Purchase your favorite, here. Indigo is not just for pillows, duvets, scarves and bags. 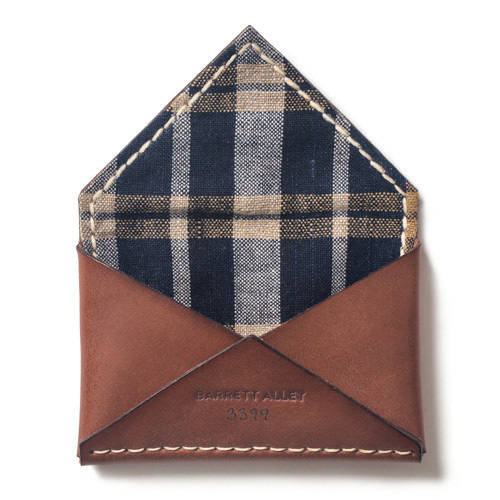 Barrett Alley of Dallas, Texas works with skilled artisans to create a handful of sumptious, indigo wallets. Barrett's popular Devilish wallet is now available in plant-derived indigo, hand cut and sewn from a single alum tawed calfskin. Over time the indigo will slowly rub off, creating a cool fade pattern, similar to a pair of jeans. 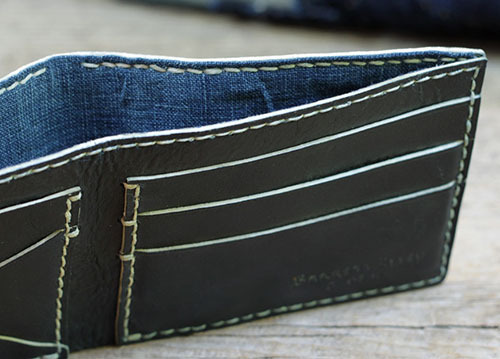 These wallets are meticulously made by hand, never by machine. Each one is constructed using a traditional saddle stitch, which is more durable than a machine stitch. As described on their site, "If a hand sewn saddle stitch breaks, the thread is only loosened on one side and the stitch on the other side of the material continues to hold the materials together." 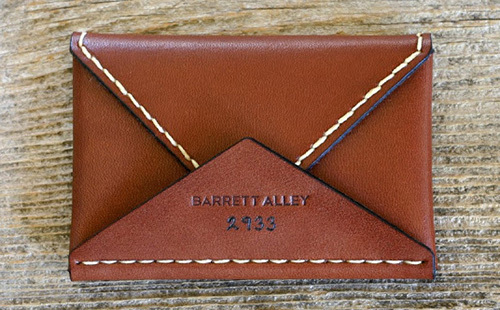 Each Barrett Alley wallet is individually numbered. My personal favorite perk is the antique fabric (sourced globally) that gives each piece a unique feel and character. Sigh,...our collective indigo obsession continues. 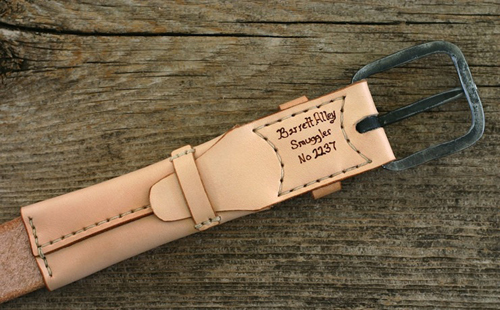 See the entire Barrett Alley shop, which includes belts, pouches and jewelry, here. It's always fun to have a hidden anything...door, hideout, treasure box- which is what makes Barrett Alley's Smuggler's Belt so appealing. 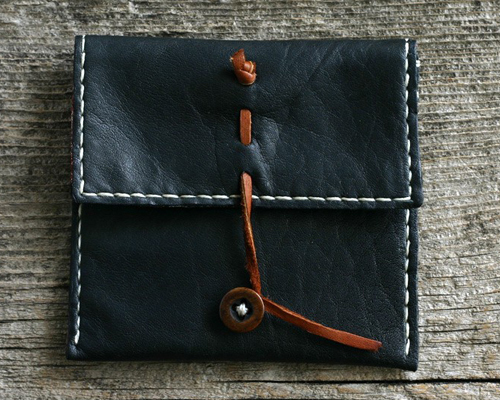 Barrett, of Dallas, Texas knows how to handcraft gorgeous leather products. For his latest endeavor, he created a belt with a hidden inner pocket that will stay closed while the belt is buckled, only revealing itselft when the belt is taken off. The buckle is made of iron and is individually hand forged by a skilled American blacksmith. The leather is tanned only via vegetable elements and will darken beautifully with age. As stated on his site, "Barrett Alley meticulously cuts the leather to perfection and hand sews each belt in his Texas studio." Just like a good man is hard to find, so too is a good wallet. But if you met Barrett Alley, you may just kill two birds with one stone. 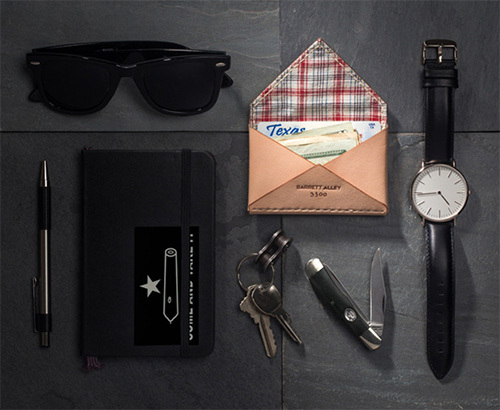 Barrett is a Dallas, Texas based leather goods designer who takes great care in handcrafting items for the modern man that have integrity, style and durability. He utilizes U.S. vegetable tanned leather as well as a selection of organic materials such as cotton, linen, glass, bone and vintage metals. 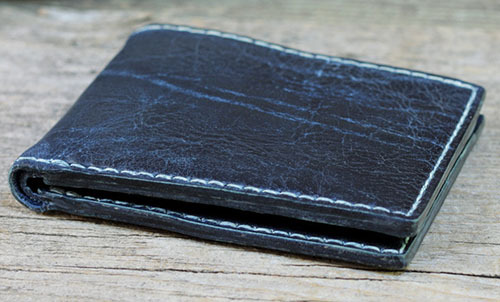 The Revelation Wallet has three separate areas for your credit cards, business cards and folded cash. I love the exposed stitch which is made with an ivory colored thread. 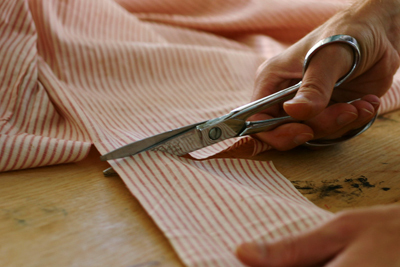 All their goods are hand stitched using a traditonal saddle stitch. Although a slower process, the end result is a much stronger and durable product. 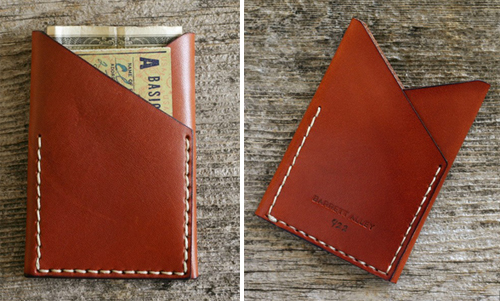 This is the Devilish Wallet, which took a lot of time and care to perfect. Each is individually numbered with 5 card pockets and a large bill opening. The highest quality leather allows it to age beautifully over time. As stated on their site, "Our leather is cut by hand with a knife and pieces are trimmed to fit together perfectly." As Barrett shared, "I worked on prototypes for over two years to get it just right." 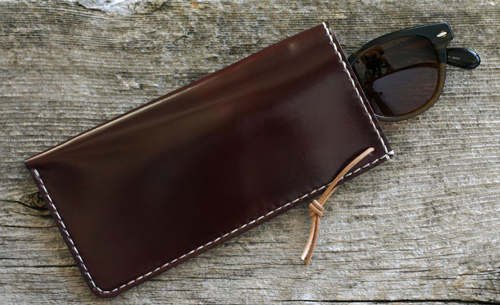 The uber handsome Dom Sunglasses Case comes in 5 different colors with some incredible antique lining options. The Judas Pouch may just be my favorite creation of Barrett's. It's finished off with a deerskin strap and an antique bone button. It's one of those items a guy can have and use for a lifetime...and it just gets better with age. It' always so nice to stumble upon a good artisan and craftsman, to find goods you know are top notch and made with care and passion. See all of Barrett's beautifully handcrafted creations, (which make amazing gifts) here.